Most of the stories in this collection are relationship-driven, either directly or indirectly; domestic, urban and mundane/realist, they focus on the horrors of real life rather than speculative or paranormal fears. Takes on this theme include: difficulties of keeping relationships going, or the repercussions of losing them; characters whose ability to form relationships with others are impaired in some way; characters whose relationship with reality are askew. Three of the six stories rest entirely on the unreliable narrator or viewpoint character. ‘I Live in the Bathroom’ is on the fairly common theme of the dead-baby horror story, with the depressed or delusional mother either causing or breaking down as a result of the child’s death; in the case the twist in this story, while horrific, makes the story itself more banal. Perhaps the most successful piece of this trio, ‘Jennifer,’ features a fat, irrationally chirpy and irritating woman in the office becoming more and more delusional and psychopathic as the story progresses. Finally, ‘Where Maisy Went…’ features a character and story very similar to Jennifer, but featuring a stolen baby. In all of these cases the horror derives from the mental illness or personality disorder of the protagonist, an all too common and sadly stigmatising trope in fiction. While one cannot blame Poelsma for inventing this device, she also does nothing especially new with it, nor, more importantly, does anything to undercut the stigma and stereotyping it involves. In contrast, ‘Jump’ is an extremely moving story in which the viewpoint character is a man perhaps with a learning disability and a very sad family background. This is not a horror story but rather a tragedy, again contributing somewhat unfortunately to the impression that characters with mental illness or neuroatypical features are weak, pitiful, and tragic; not an uncommon view, but one that it would be more subversive to undercut than simply to reinforce. It does make a nice change to see this character-type presented as sympathetic, and tell the story through his eyes, a technique that is done very effectively here. The two remaining stories, which are the least “genre” or horror in theme, are probably the strongest pieces in this little collection, both full of pathos, realism and sensitivity to tragedy. 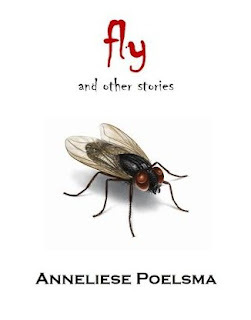 The title story, ‘Fly,’ is the tale of a lesbian, international affair, in which the protagonist and her partner never say enough to either cause or defuse fights. They almost-fight, step back, make up, and ultimately leave, again without saying enough to bring their relationship either to a head or to an end. The distance between their respective homes (Australia and the UK respectively), rather than causing the break-up, becomes a convenient excuse not to blame themselves for failing to make a go of it. ‘Skin’ may be a more dramatic story, of a woman who has suffered a heartbreak and a result “lets herself go”—this becomes an unflinching, perhaps bordering on the uncritical, study in fat-hatred and self-loathing. It is a poetic, beautiful and ultimately redemptive story, and certainly the best-written piece in the collection. While I have pointed out some issues with individual stories, and a personal problem with the overarching theme that spans two-thirds of the collection, the ultimate impression one comes away with from this small, self-published e-book is one of satisfaction. All the stories are well written and empathetic; queer issues and social stigma are often woven into the narrative; almost every story in here has the potential to make you cry. It is ultimately a very coherent collection, and positioned as it is at a slightly risky crossover between horror and literary, with social and psycho-social themes, the author has in the circumstances done a remarkably good job with the material.